Welcome to the new CaraPak website! Existing customers will need to request a new password, you can do so below or just keep browsing. If you have signed up to our new SepClean website, you can use those login details! 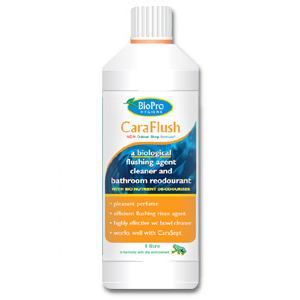 A pleasantly perfumed detergent based rinse agent to ensure efficient flushing. 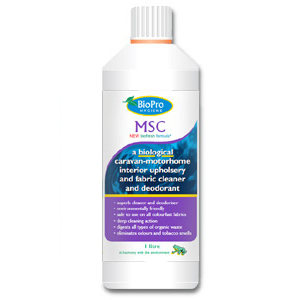 MSC is a highly effective upholstery and fabric cleaner. CaraSan is a highly effective alkaline biocidal surface cleaner. Different to traditional chemical toilet cleaners. Welcome to CaraPak. For all your caravan, motorhome and boat hygiene and maintenance product needs with FREE UK carriage on orders of £55 or more. 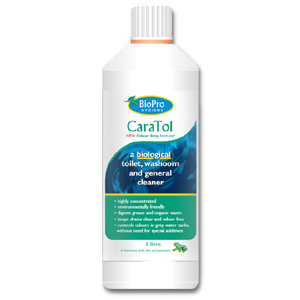 Based in Derbyshire, CaraPak is the camping, boating and caravan cleaning products trading division of BioPro UK. BioPro UK has many years experience developing, formulating and marketing a wide range of superior chemical solutions for a wide range of industries. Thoroughly tested, the CaraPak products are designed to be reliable, effective and safe. The emphasis is on environmentally friendly products and great care is taken to ensure that the product range meets this goal. CaraPak has undertaken much research into the special needs of the caravanner, boater and camper and has designed the CaraPak range of products from the experience gained. The products are thus specifically targeted to meet these unique requirements. The products are divided into two ranges. The Hygiene Range contains products that deal with problems relating to cleanliness, hygiene and related areas. The Maintenance Range contains products designed to preserve or restore your valuable investment. There is also a special product, SepClean for canal boat chemical toilet systems. The CaraPak range of products have been specially formulated for caravan, motorhome or boat owners and site operators. CaraPak are so convinced that you will find the products excellent for your purpose that we offer a full refund to any unsatisfied customer.